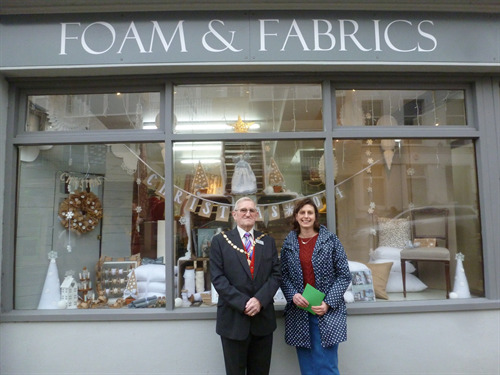 Many of Seaford’s shops took part in the recent Christmas Window Dressing competition, bringing an abundance of tinsel, lights and a great variety of festive decorations on display prepared for judging on 4th December. The judging panel consisted of the Mayor of Seaford Mark Brown, Mayor of Telscombe Cliffs Wayne Botting, Mayor of Peacehaven Robbie Robertson, Dave Argent and Joe Fackler (Seaford Chamber of Commerce), Freeman of the Town Laurie Holland and President of the Seahaven Lionesses Brenda Gomersall. The panel voted accordingly and the results were very close. The winners were revealed on 6th December as part of the Mayor’s speech at Christmas Magic. Certificates were presented on the day to the winners by the Mayor of Seaford. 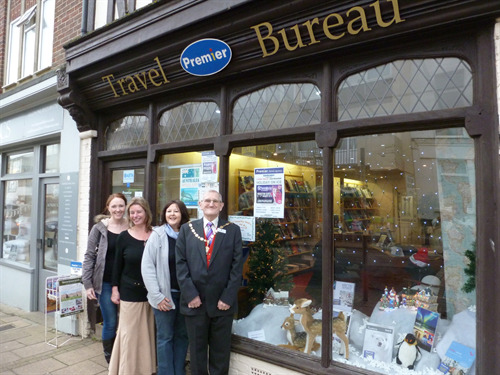 First placed was awarded to Premier Travel for their lovely snow scene and baby deer featuring as part of the display. Second place was awarded to Foam & Fabrics for a wonderful use of products and great handmade crafts. Third place went to Wynne’s, whose sleeping Santa Claus captured the attention of the judges. On 23rd December representatives of the winning businesses were invited to attend the Council Chambers to receive their prizes, vouchers for their choice of restaurant in Seaford, which were presented to them by Mayor Mark Brown. Mayor Brown said “We would like to thank all those who took part in the competition this year. It was great to see everyone getting into the festive spirit and trying their best. We believed it was appropriate that the prizes given to the winners would support local businesses. I look forward to seeing next year’s displays”.